Edinburg Vela quarterback Anthony Sotelo (7) passes the ball against Weslaco High in a District 31-6A match up at Bobby Lackey Stadium on Friday, Oct. 12, 2018, in Weslaco. Two heavyweights collide in District 31-6A action on Friday. Edinburg Vela hosts Weslaco East at 7:30 Friday night at Richard R. Flores Stadium in The Monitor’s Game of Week. Vela and East have only played once, in the bi-district round in 2016. East won 31-28 on the back of 330 rushing yards from Roy Pedraza. Granted, the stakes would have been a bit higher had East topped Weslaco High last week, but this game still has a lot on the line. If Weslaco High and Weslaco East both win this week, it would cause a three-way tie for the district crown. If Vela wins, it wins the title outright, and Weslaco High is second, win or lose. Both teams bring in devastating defenses, but East takes the edge with fewer yards allowed per game. Cardenas is the anchor of the defense, Jacob Banda is a beast on the line, and Ramsey Vasquez and Hector Muniz are at the backend to thwart opposing passing attacks. Vela’s defense is right behind with sophomores Jaime Perez Jr. and Ivan Mendoza at safety, senior linebacker Luis Gutierrez in the middle of it all getting stops, and Vela’s extremely deep defensive line is the crown jewel of the defense. Vela’s offense is certainly head-and-shoulders above East’s. Vela boasts perhaps the best all-around athlete in the Valley in senior receiver Daniel Enriquez. 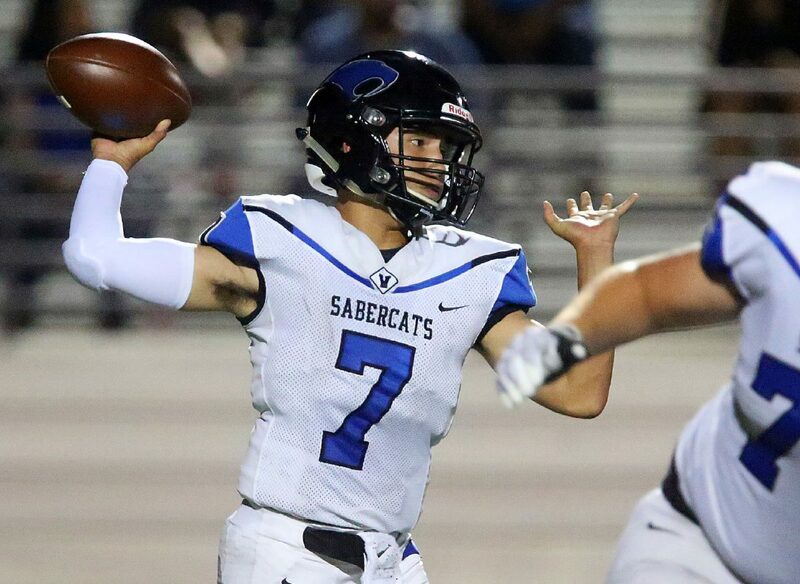 Sophomore quarterback AJ Sotelo has been lights out since the beginning of district. With that, the SaberCats can also turn to the ground and pound with their two-headed monster of seniors Aaron Alvarez and Christian Flores, with junior Kevin McKinney adding a different dimension. East’s offense centers around the running game, and the Wildcats do that better than just about anybody. Vasquez plays offense as well, and he was electric in the second half against Weslaco High, breaking a long touchdown run, and pounding in a red zone score. Josh Gonzalez, Giovanni Guerra and Andy Delgado are all talented backs who provide East with a stable, allowing the Wildcats to vary the pace and direction of their rushing attack to keep opponents guessing. Both teams are also elite on special teams, with a bevy of talented returners, and good, sound blocking up front. Vela’s ability to change the speed of the game will be important. Against Weslaco High, the SaberCats slowed the game down, and utilized a bruising rushing attack to wear down the Panthers. That may not go so well against East’s powerful defense. However, Vela can also get up and down the field in a hurry, and what doomed East last week was an inability to keep up with a fast-paced opponent. Whatever form the game takes, it will be physical, and both teams will be looking for a big win to secure their postseason seeding.